(Note) The P-P value for the deviation in the digital measurement values at the measurement center range has been converted for the measurement center distance. Linearity plus or minus 0.03 % F.S. (Note) Indicates error with respect to the ideal linear values for digital displacement output when standard objects were measured by our company. It may vary depending on the types of objects being measured. Beam diameter dia. 30 micro m dia. 1.181 mil approx. 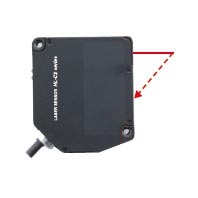 If there is a slight leakage of light outside the normal spot diameter and if the periphery surrounding the sensing point has a higher reflectivity than the sensing point itself, then the results may be affected. Cable extension Extension up to total 30 m 98.425 ft is possible, with optional cable. Accessory English warning label: 1 set [The FDA regulations conforming type includes a set of both the IEC label (written in English) and JIS label (written in Japanese)].